For if you are stout, you will have to breathe out while others around you breathe in. Got news today that Syd passed. I call him Syd, like we're old friends. We're not, but I would have liked it. 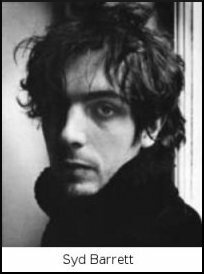 If you don't know who Syd Barrett was, go ahead and google it. I'll wait. Back? Cool. He founded The Pink Floyd back in the 60's. The Floyd remains to this day one of the only major groups that I claim as a musical influence that I have not seen live. All the others I have seen at least once (with the exception of Dylan and Springsteen, and I'm working on that). There are 3 major reasons (2 rationalizations, 1 real) for that. Reasons 1 &2: Syd Barrett and Roger Waters are no longer part of The Pink Floyd. Reason #3 (the real reason), my mom wouldn't let me go when they played the shoe at OSU. But I still dig 'em. All the iterations of the band (I count 4 distinct lineups, but I could be wrong). I even groove off of most of the solo shite that's come out from the various Floyds. Syd's was weird. Gilmour's mellow. Waters' moody. And that's ok. You can tell with each phase of Floyd which one was at the helm. Which is pretty cool to me. I admired Syd's way(the heck)-out there take on things and the Floyd's first album is still amazing to me everytime I drop the needle. It's SO night and day from Dark Side of the Moon (which is arguably their most known album). It's not the same band. And that's a good thing. And it's a good album. You should track it down and go and listen to it. I'll wait. Back? Cool. Not much of a eulogy, I know. Then again, it wasn't meant to be. More of a random stream of conciousness about the loss of a true creative genius that burned a little too brightly too quickly. Andwe weren't really friends, but I think I can say with a fair degree of certainty, that the Piper is finally at the gates of dawn. Wow. Bummer. Hopefully his last years were good ones filled with paints and pastels and some good ol' cookin' from mum.